Waltham, MA – June 23, 2015 – Exoprise, a leading provider of monitoring and management solutions for cloud-based applications and services, announced today the availability of a new set of capabilities that give IT administrators complete insight into their Office 365 services. 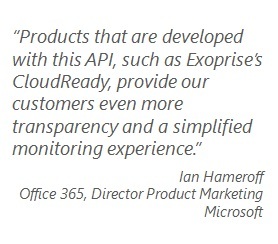 The new features integrate service status and incident communications from Microsoft’s new Office 365 Service Communications API with Exoprise’s Crowd Powered™ monitoring solution, CloudReady. With these new capabilities, Exoprise provides admins with a single pane of glass showing service health information from three perspectives: performance measurements from their network, aggregate performance data from other CloudReady users (the “crowd”), and now service health status and incident messages directly from Microsoft. 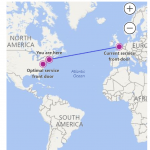 Using this three-dimensional insight, IT teams can quickly detect, identify, and resolve issues affecting their Office 365 service anywhere they occur. Exoprise enables enterprises to easily deploy both web and API transaction monitoring for their mission critical apps in the cloud, from their locations as well as Exoprise public locations. 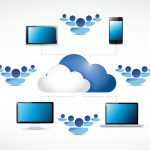 This helps IT teams address a variety of application monitoring scenarios: in-network access of public cloud apps, outside access of internally hosted web-apps and services like ADFS, mobile/telecommuting workforces, and hybrid cloud deployments. These new capabilities complement Exoprise CloudReady for Microsoft Office 365, a full-suite monitoring solution covering Exchange Online, SharePoint Online, and Skype for Business. 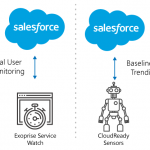 CloudReady also provides Crowd Powered™ monitoring solutions for other enterprise SaaS apps, including Salesforce.com, Box, Workday and many more. Exoprise empowers IT teams with solutions that enable effective adoption and management of mission-critical, cloud based applications and services with its CloudReady application performance monitoring solution. CloudReady provides real-time service health insight from behind the firewall to the cloud and back. This synthetic monitoring technology also leverages network path diagnostics and crowd sourced data analytics to pinpoint problems to help teams ensure the best possible cloud service performance. Exoprise helps customers get to the cloud faster and ensure success once they are there. Visit Exoprise at www.exoprise.com; on Twitter @exoprise; and on LinkedIn.